Dynamic left ventricular outflow tract obstruction (LVOTO) is one of the potential causes for postoperative hemodynamic compromise after surgical aortic valve replacement (AVR). AVR results in subtle changes in left ventricular loading conditions that may provide a substrate for dynamic LVOTO. Various anatomical and physiological factors determine the hemodynamic significance of the resulting LVOTO. The resultant LVOTO, if not addressed timely, culminates as hypotension, compromised forward stroke volume, increased left ventricular end-diastolic pressure (LVEDP), mitral regurgitation, oxygen supply–demand mismatch, or inability to wean the patient from cardiopulmonary bypass (CPB). 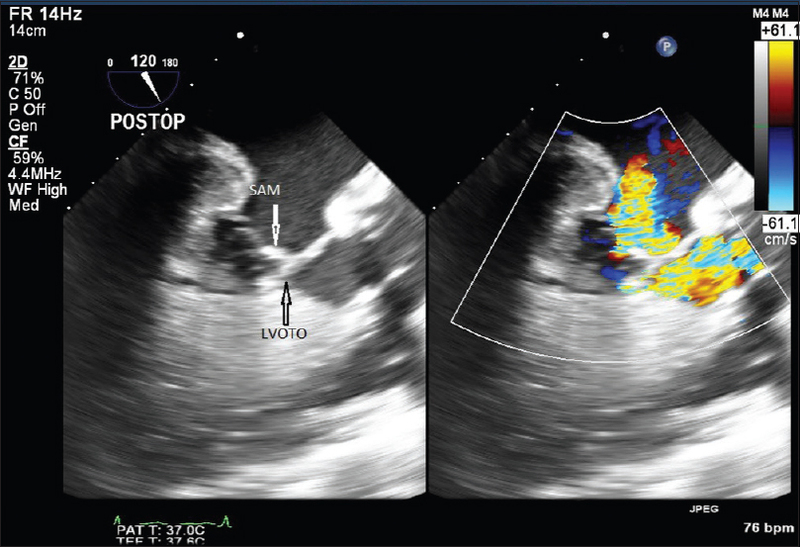 Echocardiographic identification of the patients at high risk of developing significant LVOTO in the postoperative period directs the prophylactic measures at alleviating the obstruction. These measures aim at favorably manipulating the physiology to reduce the tendency to obstruction. The echocardiographic assessment also aids in diagnosing LVOTO and delineating the anatomical causes for the underlying phenomenon. A clear characterization of the pathophysiological basis and severity of the LVOTO is imperative for the successful management. The article aims to review the risk factors, pathoanatomic mechanisms, echocardiographic assessment, and management of the resultant dynamic LVOTO following AVR. Dynamic LVOTO following AVR is a consequence of underlying structural and functional pathologies. The patients are anatomically predisposed to post-operative obstruction owing to the ventricular and mitral valve apparatus morphological characteristics. The resultant symptoms get further exaggerated in situations with increased functional demand. Most of the initial studies demonstrated that the hemodynamic changes after AVR may exacerbate preexisting dynamic outflow obstruction with life-threatening consequences. These studies postulated that fixed valvular and dynamic subvalvular obstructions coexist in patients with aortic valve disease. Bartunek et al. presented the largest prospective study on the index phenomenon. They studied 100 patients undergoing AVR for aortic stenosis (AS) and discovered postoperative LVOT gradients in 14 patients, worsened by vasodilation or beta agonists. 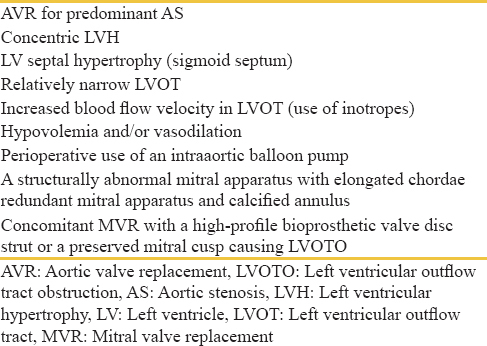 The proposed mechanism was a combination of a muscular cavity and systolic anterior motion (SAM) of the anterior mitral valve leaflet, with the LVOTO being more pronounced in small, hyperdynamic, and asymmetrically hypertrophied ventricles. However, there are sporadic case reports of LVOTO following AVR for predominant regurgitant lesions of the aortic valve. Asymmetric septal hypertrophy (ASH) and SAM of the mitral valve have been described as the causes of high intracavitary pressures in three out of the six patients with aortic valve disease by Nanda et al. Interestingly, two out of the three patients had pure aortic incompetence. In the individual case reports of AS complicated with postoperative LVOTO as reported by Schwinger et al. and Cutrone et al., the left ventricle (LV) was described as having severe concentric hypertrophy. The combination of the venturi and the drag forces forms the basis of LVOTO due to the complex interaction between the altered LV geometry and mitral valve components. Disproportionate septal thickening, although a characteristic feature of hypertrophic cardiomyopathy, may also be evident in other pathological conditions characterized by pressure-overload hypertrophy. The septal hypertrophy results as a consequence of an exaggerated remodeling response of the ventricle to the pressure overload. Lewis and Maron reported an evidence of ASH in as high as almost one-third of the total patients in their series of elderly hypertensive cohort. ASH was defined by the ratio of wall thickness of any two LV segments exceeding 1.5. The reported incidence of ASH is approximately 10% in various series involving patients with unspecified aortic valve disease. ASH was described in 9% of patients with critical AS at catheterization in a study by Hess et al. Patients can also have dynamic LVOTO without the evidence of SAM. The mechanism responsible for this obstruction is LV septal hypertrophy, especially involving the basal area of the septum (“sigmoid” septum) resulting in a relatively narrow LVOT. The elevated end-systolic LVOT pressure owing to the aortic valve disease is responsible for the “splinting” effect on the LVOT walls, thereby preventing LVOTO. The removal of a fixed obstruction post-AVR “unmasks” the underlying dynamic obstruction, in face of a decline in the LV end-systolic pressure. In addition, several physiological factors such as filling state, ventricular contractility, systemic vascular resistance, and LV volume determine the hemodynamic significance of the resultant obstruction. The above-mentioned factors predispose to flow acceleration and abnormally high DIG in the background of a hyperdynamic state in a small LV cavity and signify abnormally turbulent ejection dynamics. Various echocardiographic parameters in the preoperative as well as in the immediate postoperative period can predict the subsequent development of LVOTO after AVR. [Figure 1],,,, depicts the various anatomical, physiological, and geometrical echocardiographic findings which present an elevated risk of postoperative LVOTO. A narrow LV cavity can occur secondary to hypovolemia or due to hypertrophied cavity. This can result in an obstruction at the level of midventricular area. The preoperative LV volumes can be estimated in ME views by modified Simpson's method, particularly in the setting of asymmetric hypertrophy involving the midcavity of the LV. A preoperative documentation of a narrow LVOT is another strong predictor for a postoperative high gradient in the LVOT. The normal LVOT diameter is usually 20 ± 2 mm and can vary in accordance with the body surface area. LVOT diameter should be routinely assessed in the preoperative TEE in the ME aortic valve LAX view by the measurement of the endocardium to endocardium distance of the LVOT within 1 cm of the insertion point of the aortic valve leaflets in midsystole. Various additional features in the preoperative echocardiographic assessment can predict the occurrence of SAM postoperatively, which can aggravate the LVOTO in already hypertrophied ventricles with a narrow outflow tract.,,,, These include the presence of redundant or floppy mitral valve leaflets, posterior mitral leaflet length >15 mm, anterior to posterior leaflet ratio <1.3, and a reduced C-sept distance of <25 mm. The leaflet length measurements should be performed during diastole in the ME LAX view with measurements of each leaflet done from the base of the respective leaflet at the mitral annular level to their tips. C-sept distance is measured as the shortest distance from the septum to the point of coaptation of the leaflets and measured in ME LAX view during systole [Figure 3]a and [Figure 3]b depicting a reduced C-sept distance in a patient with septal hypertrophy]. After AVR with a relief in the valvular stenosis and the subsequent reduction in SVR, the subvalvular obstruction may become evident as explained earlier. This may manifest as difficulty in weaning from the CPB in view of decreased LV stroke volume, elevated LVEDP, and varying degree of mitral regurgitation with a subsequent deterioration of the hemodynamics. 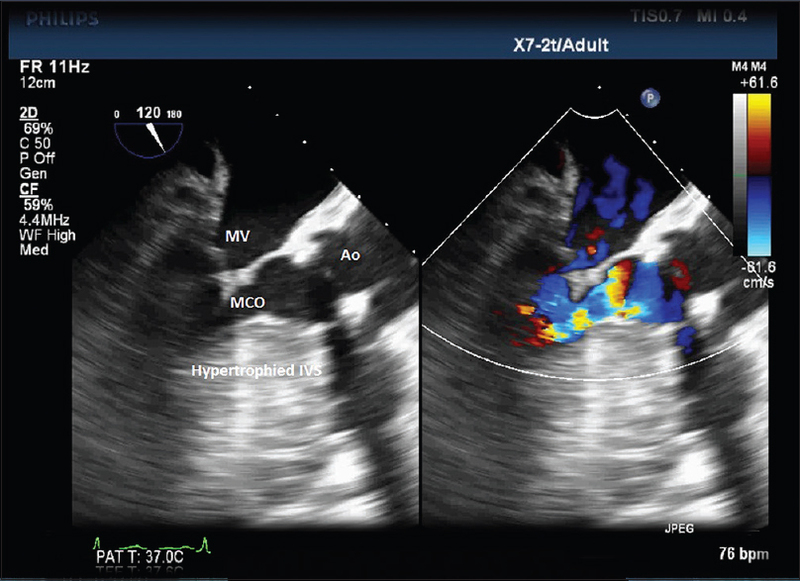 [Figure 4] illustrates a case of post-AVR LVOTO characterized by a combination of SAM and interventricular septal hypertrophy as the etiologies for the resultant turbulent flow in the LVOT. At this point along with the assessment of prosthetic valve to rule out any paravalvular leak, increased gradient across the valve and patient prosthetic mismatch, a complete evaluation of the subvalvular area and the intraventricular cavity may help to rule out any new-onset obstruction in the outflow tract. This may be evident in the transgastric LAX view at an angle of interrogation 120°–140°. Advancing the probe further with anteflexion may help in acquisition of deep transgastric LAX view from near the LV apex. Both the LVOT and the aortic valve can be interrogated in these views where the application of continuous-wave Doppler helps in identifying any gradient at the valvular and subvalvular level. 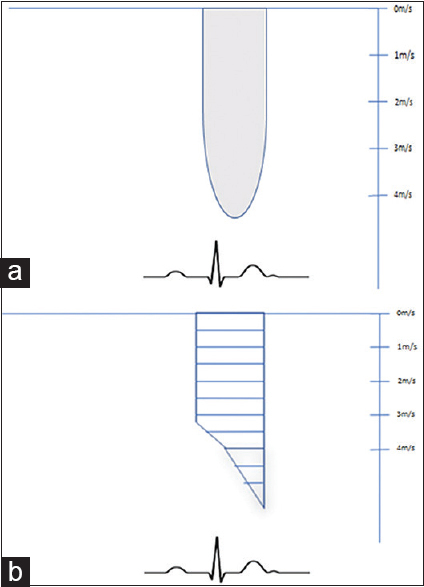 Any gradient at the level of prosthetic valve may be evident as a smooth symmetric contour of the flow profile across the valve, whereas the dynamic LVOT gradient may be evident as a “dagger-shaped” flow profile or the late peaking jet due to the increase in gradient in the late systole, as depicted in [Figure 5] and [Figure 6]. Sometimes intracavitary or midcavitary obliteration may be seen following the valve replacement, and this is particularly seen in a globally hypertrophied LV. Hyperkinetic LV may exaggerate the preexisting LVOTO in the postoperative period. The early diagnosis of LVOTO is essentially critical because the treatment and management are based on a pathophysiological rationale. Patients with preoperative risk factors for LVOTO should be evaluated thoroughly immediately after CPB weaning as they may develop gradient in the outflow tract with subsequent hemodynamic compromise. The management of dynamic LVOTO post-AVR is complex and further compounded by the hemodynamic profile of the patient. In hemodynamically stable patients, the treatment involves the manipulation of the underlying physiological conditions exacerbating the obstruction. For instance, patients are often volume depleted and on inotropic support in the immediate post-CPB period, which can exaggerate the LVOT gradient. An adequate volume loading of the ventricle along with termination of inotropic agent constitutes the most initial step of management. Titrated doses of β-blockers depress the ventricular contractility, thereby accounting for the decline in the ventricular ejection acceleration, alleviating the aortic outflow obstruction. Another favorable attribute to the β-blocker therapy comprises the effect on heart rate, wherein the decreased heart rate increases the ventricular preload by facilitating improved ventricular relaxation and longer filling time before the ventricular ejection. Vasoconstrictors, primarily α1 agonists, such as phenylephrine are beneficial as they augment the size of the functional LVOT and decrease the LVOT pressure gradient by increasing the systemic vascular resistance. Inodilators, diuretic therapy, or intraaortic balloon pump may worsen the clinical condition by decreasing the afterload; hence, they should be discontinued on suspecting the diagnosis. Some authors have proposed the role of low-rate dual-chamber pacing in the setting of postoperative shock precluding the use of β-blockers. They reported a reduction in LVOT gradients owing to the reduced heart rate and contractility. There exists a school of thought which proposes a prophylactic myectomy during surgery for the patients demonstrating marked septal hypertrophy.,,, The above measures need to be cautiously applied in hemodynamically unstable patients. If SAM contributes to the LVOTO, a grading of degree of SAM will direct the decision-making. A significant SAM may result in an LVOT gradient >50 mmHg with more than mild MR. A SAM not resolving with the medical management should prompt reinstitution of CPB to address the structural issues contributing to LVOTO. A meticulous repair of the mitral valve leaflets or septal myectomy for the thickened basal septum needs to be considered in such a case scenario. Post-CPB myocardial stunning can mask the underlying features of LVOTO in the immediate postoperative period owing to the poor ventricular pump function. With the gradual improvement in the myocardial kinetics, LVOTO may become evident. Therefore, an initial absence of LVOT gradient in the immediate post-CPB period in background of a poor LV systolic performance does not rule out post-AVR LVOTO. Hence, serial echocardiographic evaluation of myocardial function and gradient across the valvular and subvalvular areas should be contemplated within the first 48 h after surgery as a routine clinical practice. Dynamic LVOTO following AVR remains an under-recognized cause of postoperative hemodynamic compromise. It is important for the attending perioperative physician to be aware of this phenomenon, as the management is peculiar, comprising of fluid therapy, beta-blockade, and removal of inotropes which are usually continued in an effort toward hemodynamic stability. Intraoperative TEE is indispensable in early diagnosis and monitoring the efficacy of the therapy. Thus, the presence of dynamic LVOTO following AVR must be diagnosed as early as possible with a “high index of suspicion” and should be considered as a potentially fatal complication refractory to conventional management and catastrophic, if inappropriately treated. Bach DS. Subvalvular left ventricular outflow obstruction for patients undergoing aortic valve replacement for aortic stenosis: Echocardiographic recognition and identification of patients at risk. J Am Soc Echocardiogr 2005;18:1155-62. Aurigemma G, Battista S, Orsinelli D, Sweeney A, Pape L, Cuénoud H, et al. Abnormal left ventricular intracavitary flow acceleration in patients undergoing aortic valve replacement for aortic stenosis. A marker for high postoperative morbidity and mortality. Circulation 1992;86:926-36. Panduranga P, Maddali MM, Mukhaini MK, Valliattu J. Dynamic left ventricular outflow tract obstruction complicating aortic valve replacement: A hidden malefactor revisited. Saudi J Anaesth 2010;4:99-101. Tewari P, Basu R. Left ventricular outflow tract obstruction after mitral valve replacement. Anesth Analg 2008;106:65-6. Bartunek J, Sys SU, Rodrigues AC, van Schuerbeeck E, Mortier L, de Bruyne B, et al. Abnormal systolic intraventricular flow velocities after valve replacement for aortic stenosis. Mechanisms, predictive factors, and prognostic significance. Circulation 1996;93:712-9. Sukernik MR, Sumner AD, Pae WE. Systolic anterior motion of the mitral valve after aortic valve replacement for aortic insufficiency. J Cardiothorac Vasc Anesth 2007;21:574-6. Nanda NC, Gramiak R, Shah PM, Stewart S, DeWeese JA. Echocardiography in the diagnosis of idiopathic hypertrophic subaortic stenosis co-existing with aortic valve disease. Circulation 1974;50:752-7. Schwinger ME, O'Brien F, Freedberg RS, Kronzon I. Dynamic left ventricular outflow obstruction after aortic valve replacement: A Doppler echocardiographic study. J Am Soc Echocardiogr 1990;3:205-8. Cutrone F, Coyle JP, Novoa R, Stewart R, Currie PJ. Severe dynamic left ventricular outflow tract obstruction following aortic valve replacement diagnosed by intraoperative echocardiography. Anesthesiology 1990;72:563-6. Lewis JF, Maron BJ. Diversity of patterns of hypertrophy in patients with systemic hypertension and marked left ventricular wall thickening. Am J Cardiol 1990;65:874-81. Hess OM, Schneider J, Turina M, Carroll JD, Rothlin M, Krayenbuehl HP, et al. Asymmetric septal hypertrophy in patients with aortic stenosis: An adaptive mechanism or a coexistence of hypertrophic cardiomyopathy? J Am Coll Cardiol 1983;1:783-9. Routledge T, Nashef SA. Severe mitral systolic anterior motion complicating aortic valve replacement. Interact Cardiovasc Thorac Surg 2005;4:486-7. Kerut EK, Hanawalt C, Dearstine M, Frank R, Everson C. Mitral systolic anterior motion (SAM) with dynamic left ventricular outflow obstruction following aortic valve replacement. Echocardiography 2007;24:658-60. Luckner G, Margreiter J, Jochberger S, Mayr V, Luger T, Voelckel W, et al. 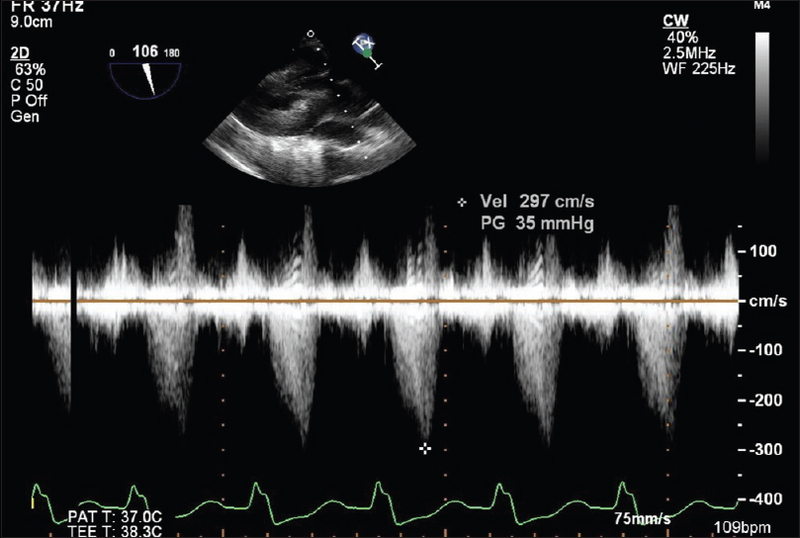 Systolic anterior motion of the mitral valve with left ventricular outflow tract obstruction: Three cases of acute perioperative hypotension in noncardiac surgery. Anesth Analg 2005;100:1594-8. Varghese R, Itagaki S, Anyanwu AC, Trigo P, Fischer G, Adams DH, et al. Predicting systolic anterior motion after mitral valve reconstruction: Using intraoperative transoesophageal echocardiography to identify those at greatest risk. Eur J Cardiothorac Surg 2014;45:132-7. Critoph CH, Pantazis A, Tome Esteban MT, Salazar-Mendiguchía J, Pagourelias ED, Moon JC, et al. The influence of aortoseptal angulation on provocable left ventricular outflow tract obstruction in hypertrophic cardiomyopathy. Open Heart 2014;1:e000176. Maslow AD, Regan MM, Haering JM, Johnson RG, Levine RA. Echocardiographic predictors of left ventricular outflow tract obstruction and systolic anterior motion of the mitral valve after mitral valve reconstruction for myxomatous valve disease. J Am Coll Cardiol 1999;34:2096-104. Ibrahim M, Rao C, Ashrafian H, Chaudhry U, Darzi A, Athanasiou T. Modern management of systolic anterior motion of the mitral valve. Eur J Cardiothorac Surg 2012;41:1260-70. Coddens J, Van Alphen J, Deloof T, Hendrickx J. Dynamic left ventricular outflow tract obstruction caused by afterload reduction induced by intra-aortic balloon counterpulsation. J Cardiothorac Vasc Anesth 2002;16:749-51. Barkman A, McCay J. Cardiogenic shock in a patient with hypertrophic obstructive cardiomyopathy after insertion of a pacemaker. Am J Crit Care 2002;11:537-42. Varghese R, Anyanwu AC, Itagaki S, Milla F, Castillo J, Adams DH. Management of systolic anterior motion after mitral valve repair: An algorithm. J Thorac Cardiovasc Surg 2012;143:S2-7.